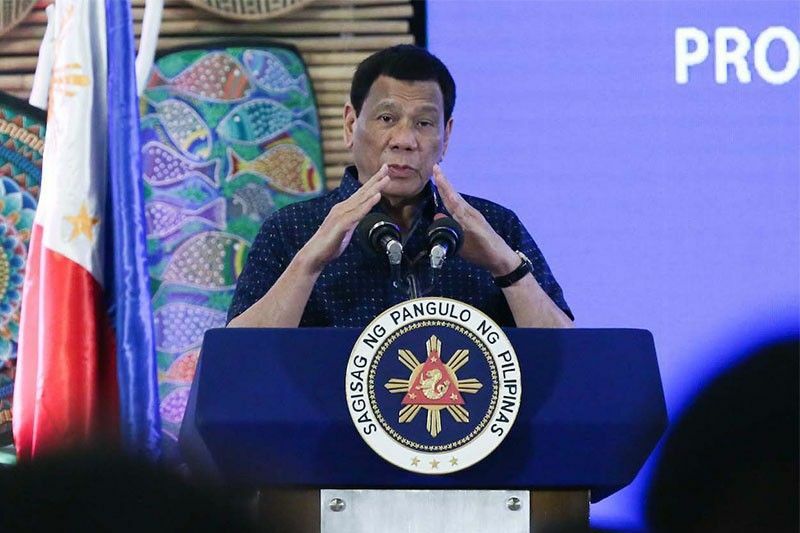 President Rodrigo Duterte delivers his speech during the 31st Annual Convention of the Prosecutor's League of the Philippines at the Asturias Hotel in Puerto Princesa City, Palawan on April 4, 2019. MANILA, Philippines — President Rodrigo Duterte's statement on the presence of Chinese vessels near Pag-asa Island in the West Philippine Sea counts as invoking the 2016 arbitral ruling on the disputed waterway, the Palace said. Malacañang insisted that the Duterte administration "never shelved" the arbitral award that invalidated China's historic claims over the South China Sea, part of which is the West Philippine Sea. The government has, however, played down the ruling in favor of seeking warmer ties with China. "When he said, 'Do not touch our property. If you do any harm to our soldiers, we will respond in kind that effectively' has already made a strong assertion of sovereignty and statement relative to the to the arbitral ruling," presidential spokesperson Salvador Panelo said Monday. The president did not mention the ruling in an April 4 speech where he said China should "lay off the Pag-asa because I have soldiers there." The Philippines does not also have the "capability of enforcing it alone by force, not to mention the fact that performing armed acts of enforcement could only trigger a bloody war," according to Panelo. "It might be the right time to add to 'unshelve' our arbiral outcome and sit down with China for the enforcement," Del Rosario told radio dzMM last Saturday. "Usually in a bilateral meeting, the host makes an opening statement and in that opening statement the host can raise whatever issue he wants. And then the invited visiting host responds. In that response, he can raise an issue he wants," Panelo said. On the issue of the presence of hundreds of Chinese ships near Pag-asa Island, Malacañang said the Philippine government expects them to respond "whatever response they want." "Then we will wait for the president's decision. That's his call," Panelo said when asked if Beijin refuses to pull out their vessels in Philippine waters.